What: Come take part in a Troop 109 Holiday tradition. This is our 28th year of selling Christmas trees to raise funds for Troop 109 and individual Scout accounts. Scouts will help customers select a tree, give the tree a fresh cut (if asked) and assist with loading the tree into their car (if asked). 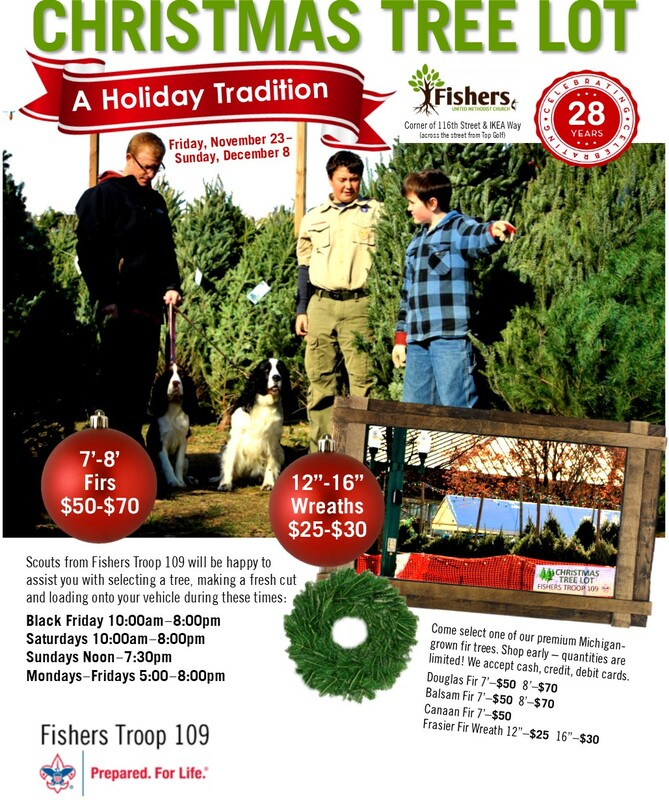 Come select one of our premium Michigan-grown fir trees or wreaths. limited! We accept cash, credit, debit cards. Each Scout must be accompanied by an adult to assist. Please only sign up for up to two time slots. Enter the scout’s name, the adult’s name and a phone number in the spreadsheet. Download a JPEG here or flyer here to share with your friends. Contact our Tree Lot Coordinator, Mr. Wood with any questions.